Photo of the Day: A Day in History. 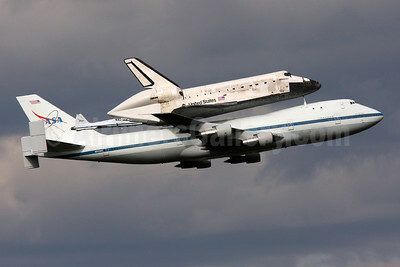 On April 17, 2012 the Space Shuttle Discovery was retired and flown on top of NASA’s Boeing 747-123 N905NA (msn 20107) from the Cape Canaveral launch facility in Florida to the Smithsonian Institution facility at the Steven F. Udvar-Hazy Center at Dulles International Airport. N905NA is pictured arriving at IAD where it pictured making a low-fly by as a final salute. A NASA T-38 is flying alongside documenting the historic trip. Discovery will go on display at the Smithsonian museum. N905NA was originally delivered to American Airlines as N9668 on October 29, 1970. This entry was posted in NASA and tagged NASA on April 17, 2012 by Bruce Drum.